Despite a few foibles, this is a user-friendly all-in-one gaming PC. It can power through the latest games, and should have more than enough steam for what's to come. It's funny: All-in-one PCs are often considered "family computers." There are a lot of folks out there who assume that these touch-friendly machines are meant to stay in the living room or den and are solely used for homework, web browsing and, every once in a blue moon, streaming movies. Spend 10 minutes with the MSI AG240, and you'll throw that "family friendly" monicker out the window. Don't let the all-in-one form factor fool you, this is a gaming PC. And sure, it can be used for that other productivity stuff too, but there's an Nvidia GeForce GTX 860M graphics chip, 16GB of memory and a 4th generation Intel Core i7 processor inside that are begging to play BioShock Infinite and Assassin's Creed on their highest settings. If that doesn't cement the idea that this is a gaming rig, MSI will give you six months of one of the best game-streaming services available, XSplit, for free – just as long as you don't get turned off by the anti-flicker, but-awfully-glare-laden, screen first. Packed into an impressively slim 23 x 1 x 17-inch (W x D x H) box, the AG240 is the definition of lean. From bottom to top, the black, brushed-aluminum base meets a red metallic shell that houses two 5W Creative Sound Blaster speakers right before reaching the 2-inch-thick glass frame. This brings us to the 23.6-inch non-glare, anti-flicker touchscreen that supports full 1080p (1920x1080) resolution. Anti-flicker, for those who are new to screen terminology, allows users to snap high-def photos of the screen without a purple-hued splotch in the picture. That's not the only trick up this screen's sleeve, though. 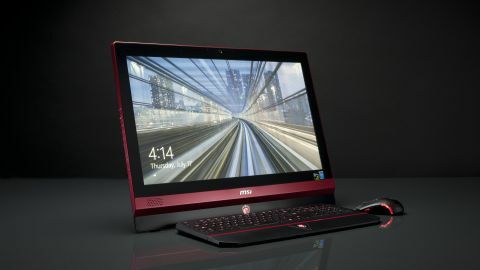 MSI installed a screen in the panel that emits a lower amount of blue light, reducing eye-strain over long sessions without giving the monitor a strange-colored tint. In practice, this worked fairly well, allowing me to play through SuperGiant Games's Bastion in two short sessions. All these fancy components would work better, however, if the screen didn't have the reflective power of a wall mirror. Sitting in a moderately lit room, you'll be able see outlines objects behind you. Sit in a room with a few lamps nearby and your screen will light up like a Christmas tree. Several days of gaming were hindered, if not completely derailed because of the overly reflective screen. Even a moderately lit room blows out the contrast, making it impossible to see the deepest blacks. Sitting in a brightly lit room, looking at the screen can be almost headache-inducing. The AG240 is best used in a dim room or after dark, which for some nocturnal gamers, coincides nicely with the time they'd use a home computer. If you're a day-time user, though, the AG240's panel is a definite deal-breaker. Spin the all-in-one around and you'll see a card reader slot and two USB 2.0 ports on its left side along with menu buttons that, most notably, allow you to switch to another HDMI input – but more on that in a minute. Finally, the minimalistic back panel sports a few cooling vents, a sturdy, never-slip stand, and plethora of ports.